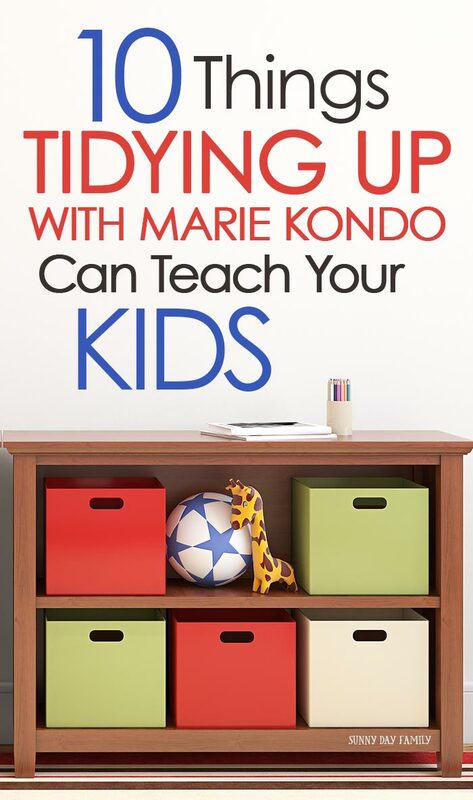 How Marie Kondo's life changing magic of tidying up can help your kids learn to declutter and so much more. When I decided to give Marie Kondo's Konmari method of decluttering a try, I was confident it would transform my home. Or at least my drawers and cabinets. But what I did not expect was the impact that it would have on our family, especially my kids. I've always been organized and tried to teach my twins to do the same, but with kids clutter has a way of creeping in. When we started tidying up using Marie Kondo's method it truly changed our entire family's mindset about the things that we have, what we keep, and what we don't need. 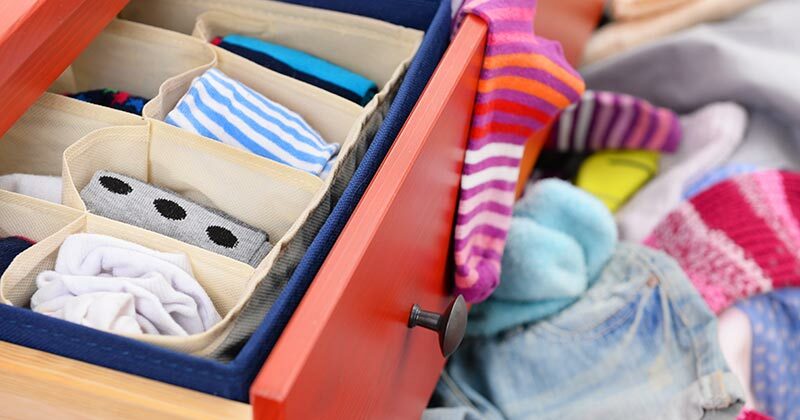 If your family is struggling with clutter, and you feel like you can't get your kids on board no matter what you do, then Konmari may be just the thing that you need. 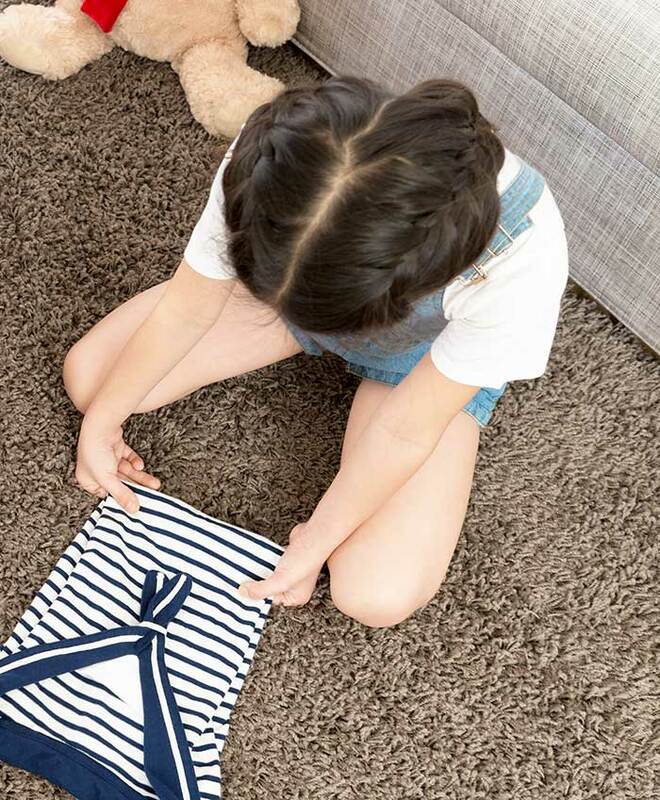 Whether you're watching Tidying Up with Marie Kondo as a family, or reading The Life Changing Magic of Tidying Up, implementing the Konmari method of decluttering can teach your kids several important lessons. It's no secret: Americans are drowning in clutter. And not just physical stuff. Our kids' calendars are filled with school, activities, and homework more than ever. Not to mention the digital clutter that bombards them at every turn. With a proven link between clutter, depression, and anxiety, it is no wonder that depression and anxiety are on the rise in our children. One of the ways that we can help alleviate this is by helping to clear out the clutter in our homes, both physically and mentally. When we declutter our space we encourage our kids to relax, be creative, and actually enjoy the things that they have. Not sure you can make Konmari work when you're a busy mom? Here are my tips to make it easy! I've witnessed this first hand with my own kids. It may seem counterintuitive, but they play more when we have less toys. They are more likely to engage in imaginative play, read, and draw when their space is not consumed by stuff. What else can tidying up teach your kids? Here are 10 lessons our family has learned on our decluttering journey. Moms. Stop folding all the laundry. I have been guilty of this since my kids were born, but no more. It’s not only important that you use Marie Kondo’s folding method, but that you do it together as a family. Each member of your family should be involved in this and help you fold the clothes. I totally get that mornings are hectic, especially on school days. But one of the things Marie Kondo recommends to do every day is a morning and evening tidy. This can be as simple as making sure your kids put their breakfast dishes in the dishwasher and their pajamas in the hamper in the morning, or ensuring that toys are put away before bedtime. Getting in this routine will help your mornings and evenings run much more smoothly. As you tidy up, make sure you are creating a home for each and every one of your items. This has been something I have always done and I can tell you that it makes clean up so much easier. Even when my boys were 2, they were able to help put things away because they know where things go. This is a great way to help kids learn to let go of their things. Letting go of things can be hard, but expressing gratitude and saying goodbye will help them to deal with the process. Expressing gratitude also helps them to appreciate the items they chose to keep more. Once you've finished tidying up your home, the last thing you want to do is bring in more stuff and ruin your hard work. This is a great opportunity to teach your kids about things that we want vs. things that we need, and how to make good decisions about the things that we choose to buy and bring into our home. The end goal of the Konmari method is that you will have a home full of items that spark joy for you and your family. If something doesn’t spark joy, don’t feel guilty about letting it go. This goes for your things as well as activities. It may have sparked joy for you in the past, but it’s okay that it doesn’t now. There is a reason sentimental clutter is the last step in the Konmari method. It’s because this will be the hardest category to tidy. By doing the others first, you will build up momentum and when you finally get to the sentimental items, you’ll be ready to handle them. As you help your children tidy up things that are sentimental to them, you can help them to realize that "stuff" does not equal memories. Encourage your kids to keep journals or take photographs instead of collecting things to commemorate their experiences. It’s not your job to decide what sparks joy for each of your family members. If you have young children, you may need to help them, but you shouldn’t be doing this job for them. Giving your children responsibility for their own items will help encourage them to better care for them and to appreciate them. Just because something doesn’t spark joy for you, doesn’t mean it won’t for any of your other family members. These decisions should be made together and you need to respect other people’s choices. This is an important lesson for kids and parents to learn and practice in decluttering and in so many other areas. This is not an easy lesson to learn but kids can easily appreciate how much joy can be found in an uncluttered environment. As you work through the Konmari method with them, they will find that they are soon surrounded only by things that bring them joy. They will be able to choose the clothes they love to wear easily and play with the toys that they enjoy the most. And all with the space to be creative and inventive, and to truly be themselves. Want to help your kids to be more organized? Check out how our kids' command center can help get it done! Ready to organize your life and enjoy your family? Subscribe to my newsletter for all my favorite tips, free printables, and more!